This is a great example of how small Hydropower can save a city, municipality, or educational facility some good money. Its a one year payback on small hydropower. We will be sure to highlight this to our friends in APPA. Saves you $57k year in power utility costs. Adds to your sustainability efforts… this was done for a startup energy company that was a spin off from technology developed by R&D funding from the U.S. Department of Energy. 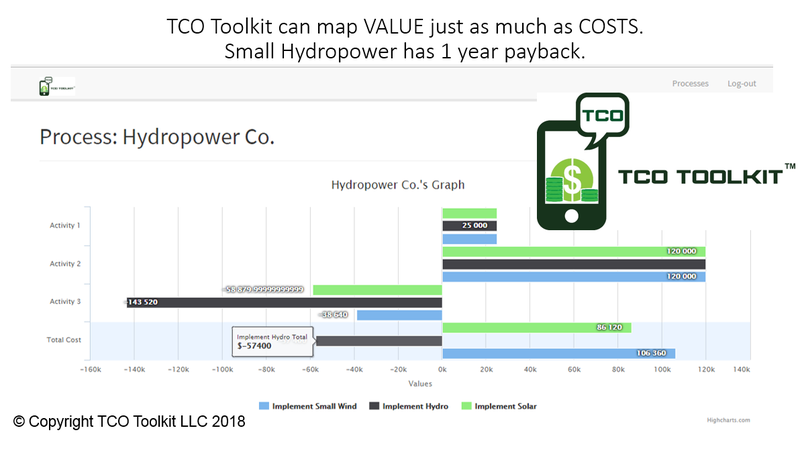 The TCO Toolkit can capture VALUE just as much as COSTS… This example show how the added Revenues of the Hydropower counter the costs of implementation. Note: This feature capability can drive economic value added, vs just procurement cost, into your RFQ process. 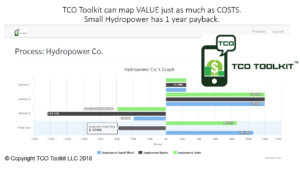 The ability for the TCO Toolkit to demonstrate VALUE over more than just costs was a key driver in its original development. So this example also shows how the TCO Toolkit can help with Sustainability efforts. Speaking of Sustainability, did you know that 90% of TCO Toolkit’s HQ is powered by Solar? ← Wake Forest University to Host TCO Toolkit for: “B2B Marketing in the Digital Era” for purchasing, marketing, and sales personnel.